1 of 1 In medium-size bowl, whisk together vinegar, mustard, salt and pepper. Drizzle in oil, whisking until oil is thoroughly incorporated. Stir in garlic, thyme and oregano. Set aside half of the dressing. 1 of 3 Prepare outdoor grill with medium-hot coals or heat gas grill to medium-high. Lightly brush grill with vegetable oil. Generously brush peppers, zucchini, squash, onion and tomatoes with some of the remaining dressing. 2 of 3 Grill vegetables in batches about 3 minutes per side or until tender, about 18 minutes total. Brush vegetables with additional dressing halfway through grilling. Remove vegetables from the grill; keep warm. 3 of 3 In large bowl, toss together cooked pasta with reserved half of dressing and any remaining dressing used for grilling vegetables. Toss in basil and mozzarella cheese. 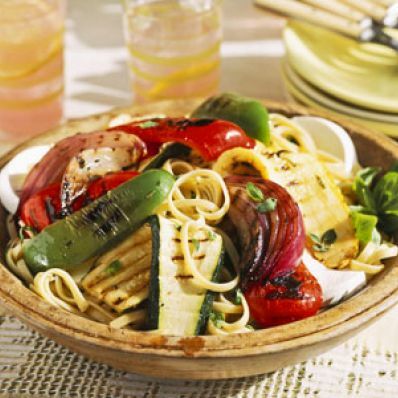 Arrange grilled vegetables over top. Serve warm or at room temperature. Per Serving: 588 mg sodium, 8 g fiber, 698 kcal cal., 21 g pro., 10 g sat. fat, 27 mg chol., 36 g Fat, total, 75 g carb.